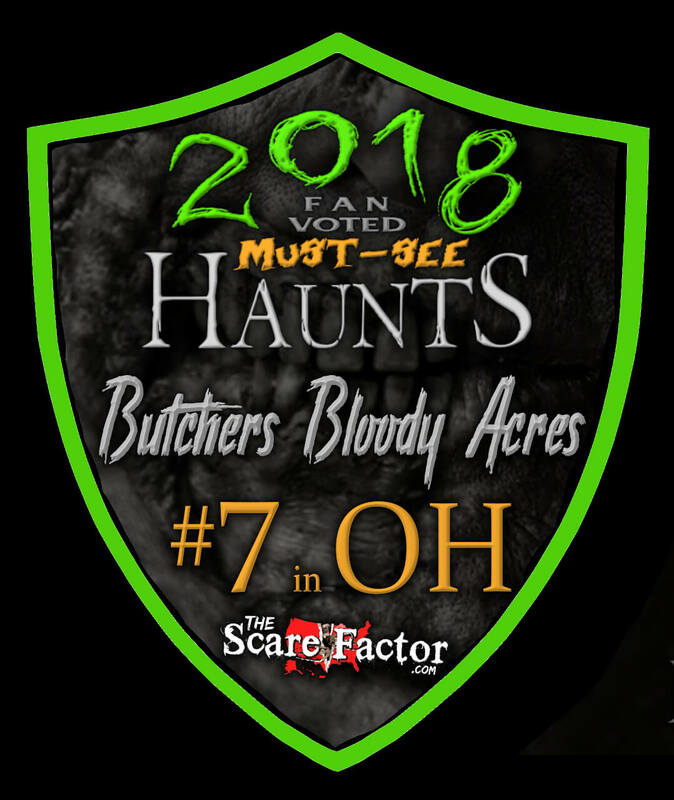 Butchers Bloody Acres is a Haunted Attraction located in Alliance, OH. reviewed this attraction on October 13, 2017. 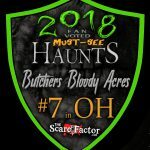 To be honest, when we first learned that Butcher’s Bloody Acres had been forced to relocate just a month before the season was about to start, we weren’t sure what to expect and had considered passing them up this year to give them time to get fully built and try again next year. But, we ventured north to Alliance, Ohio anyway and…we are glad we did. It wasn’t spectacular but, to see what they accomplished in the small amount of time that they had to put it together, shows their determination and passion for the season. We had a great time and are very much looking forward to what they bring to life next year. One of the greatest pieces of evidence to their character and sense of humor, is their waiver. You really should read that thing! The cast was a bit sparse but, the ones that were there threw themselves into their roles. They definitely had a desire to be there and crept through the woods like little demonic ninjas, popping out of the darkness on their unsuspecting victims and even dragging themselves along the ground at a rapid pace. They maintained character very well and if something wasn’t working right, they quickly improvised to not let the customer down. They weren’t incredibly interactive, but the dialogue that some of them had was quite entertaining. There were several movie characters portrayed. Jason Voorhees, Freddy Krueger and Pennywise all made appearances and the costumes were all believable as were the actors wearing them. Jason was particularly impressive as he nearly took off Katie’s head with his machete (part of the act). There were several clowns prowling the woods that evening as well and their costumes and makeup were pleasantly detailed. As you can tell, they utilize a lot of masks but, they were all worn appropriately and weren’t just thrown on. In the future, it would be great to see them take on a makeup artist and bring out some original characters. This really isn’t a haunt that you would just stumble upon on a nightly drive, it can be tricky to find but GPS was able to get us there. There were a couple of hand-painted signs out by the road and a security guard with a flashlight pointed us to a place to park. Due to the rain earlier that week, the grass clearing that served as the parking lot was a bit muddy and, since they were still waiting for the electric company to run power to the property, it is also really dark. However, they have a nice fire going near the brightly lit ticket booth and the laser grid sparkling in the trees created an awesome effect in the parking area. The staff were all very helpful and friendly, explaining to us some of the technical issues that they had suffered that evening (of course, it was Friday the 13th) and then sending us on our way down the path after we signed our waivers. This is an outdoor haunt and with that comes certain hazards. The biggest one here is the trail itself. It can be a bit rough and uneven at times, which forced us to focus a lot on where we were stepping. It took a little away from the effectiveness of the scares and with the absence of much lighting, it was hard to know if you were heading in the right direction. However, as long as you are careful and understand that this is a walk through the woods, you will be fine. We hope that, during the off season, they take some time and try to make the walk a little smoother. Without electricity yet, they had to reserve their generator power a bit. So, there was no fancy sound system playing before you entered the trail. They did however, have some cool decorations, a laser light show, a warm fire and the screams of previous patrons echoing through the trees. There was no mistaking that you were at a haunted trail and, honestly, I don’t really think that they needed any music. It was kind of nice to hang out by the fire and listen to people screaming in the woods. You got a good sense of what you were in store for…and then, had a place to relax after it was over. This was the first time that we have seen the laser grid used in the trees that way. It created a great effect that looked like millions of lightning bugs filling the woods. The Freddy Krueger scene was also pretty spectacular as the bathtub exploded into flames. The rest of the scenes that they created were nice but, not highly detailed and a lot of what they did do, was lost in the darkness. Poor Freddy looked like a shadow, with the only light in the area coming from behind him. Once they get their electricity installed, I am looking forward to seeing what they do with it. 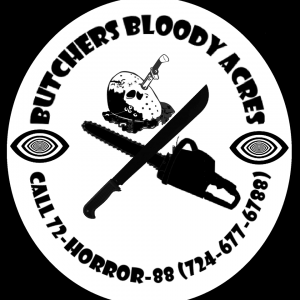 Butcher’s Bloody Acres doesn’t follow a single theme. All in all, they are pretty good at getting a scare; utilizing mostly pop-outs and a bit of suspense. Other than the staged scenes themselves, it was hard to tell where the scares would come from as you made your way along the trail. These folks are pretty good at creeping through the woods undetected and have the entire area to play in. Had it not been for us having to be so careful walking through, they would have gotten a few more scares out of us. It took us roughly 17 minutes to walk the trail and, with a ticket price of only $10, that gives them a Minutes Per Dollar Value of 1.70…just above the 1.50 average for most haunts…and we felt like we certainly got our money’s worth out of it. They have a lot of room to grow and, from talking with the owners afterward, that is exactly what they plan to do. We look forward to seeing what they have to offer next year!